The sixth day sounds like an extended version of one of those can’t miss exercise videos you find on a TV infomercial (would never sell though as folks are more into six minute or six day results). No doubt, there is certainly a fitness aspect to today’s post but another “burn” is more of the focus. 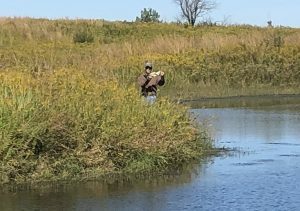 You see, today we’re talking about a less glamorous type of bass chasing called “walk-in strip mine fishing.” No need for a $50,000 bass boat, a 250 HP outboard and a couple television sized fish finders here, boys and girls. Nope, just a pair of boots, a backpack, some rods and more than a little determination. Ever navigated strip mine terrain? Ever seen it when the terrestrial vegetation is left to run wild? 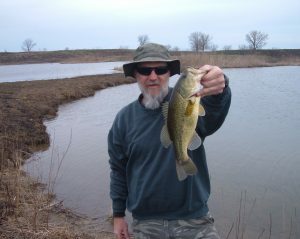 Now that’s a rough combo for a fifty-something guy out there trying to fool a few bass (actually more like a few dozen). Photo comparison, same exact spot with me on left from 4/21/18 and Brent on right from 9/23/18. So, imagine my delight as I pulled into the parking area of one of my stomping grounds this past April to see it laid bare courtesy of a controlled burn. Yep, no more neck high weeds to plow through while trying to find fishing holes that are only revealed when you break through the vegetation upon reaching the water’s edge. No more hidden, eroded ruts that sneak up on you while your eyes are focused on the tough to penetrate jungle that lies before them. Instead, it’s a regular walk in the park with everything laid out before you in a sea of soot. A leisurely stroll with no surprises, no stumbles and no falls. However, with a fresh start and a Midwest spring, Mother Nature does her thing as the vegetation energetically rebounds to reclaim the terrain. And it sure doesn’t take her long to make ambulatory navigation a challenge once again.